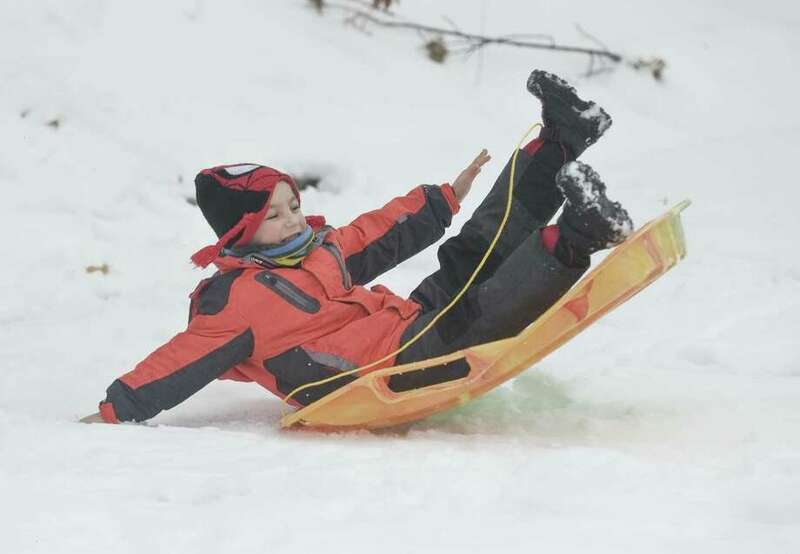 Alex Nikolas, 6 of Darien, sleds down a small hill at Brien McMahon High School on Saturday. Ryan Gregory, of Darien, was among some 2,270 students at the University of Alabama in Tuscaloosa who were awarded degrees during winter commencement Dec. 10. Gregory received a bachelor’s degree. The Family Britches stores in New Canaan and Chappaqua, N.Y., are celebrating the holiday season by donating 5 percent of their December proceeds to San Miguel Academy of Newburgh, a school many local residents have adopted for its incredible work with low-income, at-risk middle school boys. An additional 5 percent discount will be given to clients who mention San Miguel at the time of purchase. Darien residents Brendan and Megan McCarthy helped found the San Miguel Academy. Perpetual Insights has named James Thomas principal and Scott Barrett director. The Darien residents will split time in the consumer goods recruiter’s offices in Darien and New York City. Thomas previously was vice president of talent acquisition for Sotheby’s and before that was with Michael Page. He focuses on finance and accounting. Thomas has a degree from Edinburgh University in Scotland. Barrett was formerly managing director at FTI Consulting and focuses on supply chain roles. Barrett graduated from Tulane University in New Orleans. At Home In Darien hosted its annual meeting at the Darien Library Dec. 6. The meeting was open to the public and attended by more than 65 people, including At Home In Darien members, public and private sector community leaders and the media. Susan Bhirud, Pam Payne and Pat van den Broek were elected to the At Home In Darien board. Also elected were Annie McGuire as president; Mallory Arents, Peter Carnes, Peter Eder and Robin Woods as vice presidents; William Ball as treasurer; Diane Barston as secretary, and Tamsin Sickinger for governance. Carolyn Anderson , Holly Hawes , Wyn Lydecker , Patrice Malvisi and Frank Rosenberry retired from the board. During the meeting, Executive Director Gina Blum summarized the organization’s accomplishments, highlighting the launch of its new website. Christianne Kovel, a senior policy analyst for the recently restructured state Commission on Women, Children, and Seniors, was the keynote speaker. Kovel discussed the projected growth of Connecticut’s senior population and its impact on state policy supporting older adults. The annual meeting was filmed by TV Channel 79, Darien’s government and community TV station, and broadcasted live. The meeting ran about 60 minutes and can be viewed by visiting the At Home In Darien website, athomeindarien.org, under the tab, About Us — In the News. A heroin epidemic is sweeping the country, and the state is no exception, with two people dying from an opioid overdose each day. The Darien Health Department is asking for local students’ help to get the word out about opioid abuse by participating in the Opioid Prevention Committee’s slogan contest. The contest is open to middle and high school students in lower Fairfield county from Darien, New Canaan, Stamford and Greenwich. Students are encouraged to submit a 30-character slogan that is attention-grabbing and warns readers about the dangers of drug use. Contest entries must be submitted to norxabuse.com by 4:30 p.m. on Jan. 8. The winner will get $250 in prizes. Two honorable mention winners will get $100 in prizes. All participants will be acknowledged on the contest website. The winning slogan will be announced and a public award granted as a component of the Health Needs Assessment presentation by the Darien Health Department at the Darien Library on Jan. 19. The award will constitute the official launch of the campaign and the slogan will be the official “tagline” in the upcoming campaign and marketing materials to raise awareness of the dangers of prescription drug abuse.